German composer born in Bonn on December 17, 1770 and died on March 26, 1827 in Vienna. He received the basics of piano from his father, musician in the service of the Elector of Cologne in Bonn, who aspired to become a new Mozart. Soon was entrusted his education to some friends of the family, among them was Christian Gottlob Neefe, organist of the Court, who taught him to fund the piano and music theory. Thanks to his master, he/she made relations with the cultural elite of Bonn. Her first concert tour was made in 1781 to the Dutch city of Rotterdam. In 1784 he/she became a permanent member of the chapel of the elector Maximilian Franz, protective of young talents. His first trip to Vienna, which was interrupted due to the death of his mother took place in 1787. The production carried out in Bonn includes numerous lieder and piano works, including the three sonatas dedicated to the elector, three string quartets and a concert in e flat major of which is only preserved part solo, as well as a fragment of a Concerto for violin in c major, a Trio for flute and bassoon, an octet for wind in e flat major, music for a chivalrous ballet and two Imperial cantatas. In 1792, he/she decided to settle in Vienna, city of great musical atmosphere and where nobles kept own orchestras, wind ensembles, and string quartets. There was quickly known for his masterful execution of the piano and his compositions. Until 1794 the Elector of Bonn helped him economically, and later found other patrons in the Viennese aristocracy, whose houses and palaces used to give recitals. He expanded his knowledge with Schenk, J. Haydn, Albrechtsberger and Salieri. In 1795, year which was presented for the first time to the Viennese public, were his three Trios with piano Op.1, first of his works that he/she gave value, as well as his three sonatas for piano Op. 2. in the following year he/she made various tours in Nuremberg, Prague, Dresden and Berlin. In 1800, he/she premiered his first Symphony and ended up composing six Quartets for string op. 18, which turned him into a master of the genre. In 1802 ensued him some hard of hearing which, in the opinion of the doctors who treated him, would go on the rise. The bad news made him write the so-called testament of Heiliegenstadt, addressed to his brethren, which communicated them to his illness and bequeathed their property. He/She decided to leave the career of virtuoso and devoted himself fully to composition. Between 1796 and 1814, years that represent one ever-increasing his work improvement, became one of the most famous composers of the time. At that time, commissioned by the ballet master Salvatore Viganò created music for the creatures of Prometheus (1801), ended the second Symphony (1802) and the oratorio Christ on the Mount of olives (1803). In the Third Symphony, the heroic (1804) already developed all its style, overcoming influences of Mozart and Haydn. Beethoven. First Symphony in c major op. 21. andante cantabile. Beethoven. Sonata in c sharp minor op. 27 "Claro de luna". Beethoven. Second Symphony in d major Op. 36 larghetto. Beethoven. Third Symphony in e flat major op. 55. "Heroica"
In 1805 premiered at the theater An der Wein, hardly unsuccessfully, his opera Fidelio or conjugal love. As this work was termed too long, Beethoven revised it and condensed it, emphasizing the moral force of history and the virtues of the character of the heroine, Leonora. The new version was released a year later, but had only two performances. The work was forgotten until 1814, date in which triumphed in all European theatres. East last year had already composed the greater part of his work: eight of the nine symphonies, the first mass, nine eleven openings, Concerto for violin and piano concertos, ten sonatas for violin, three of the five cello sonatas, twenty-seven of the thirty-two sonatas for piano and most of his chamber music. Beethoven was then at the height of his fame and orders piling up. These included requests from 1812 to put music to two works by August Kotzebue, King Stephen, first benefactor of Hungary and the ruins of Athens, to the inauguration of the theatre of Pest; the cantata the glorious moment (1813) for the opening of the Congress of Vienna, and the good news and the triumphal arches (1813), aimed at the final songs of patriotic acts of the entrance of the armies allied in Paris. Beethoven. Fourth Symphony in b flat major op. 60, allegro vivace. Beethoven. Fifth Symphony in c minor op. 67 allegro with brio. Beethoven. Sixth Symphony in f major Op. 68, "Pastoral". Final. Beethoven. Seventh Symphony in a major Op. 92, allegretto. Beethoven. The eighth Symphony in f major Op. 93, minuetto. Beethoven. Egmont Op. 84, Overture in f major. From 1815, the composer's life changed radically. His deafness was accentuated, numerous friends died or left Vienna and his works were hardly already performed Rossini operas and chamber music of light character that also among the Viennese. However, after this crisis began a stage in which composed important works such as the Ninth Symphony, which was completed in 1824, his second mass, completed in 1823 and premiered in Petersburgo and the Overture for the consecration of the home (1822), written for the inauguration of a new theatre. Between 1818 and 1822 he/she completed the series of piano sonatas, including the Op. 106 (Hammerklavier) and the Op. 110, both with very advanced writing for the times. He/She spent the last years of his life to the string quartets, which represent the most personal of his work. 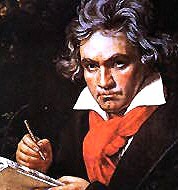 Death of Beethoven in 1827, his inheritance was sold at public auction, but have been published in the author's life most of his compositions, his work has just lost. The German composer became a public figure of Viennese cultural life and embodied the figure of the free artist, that is not folded to the tastes of the nobility. As it is said of him, Beethoven wrote "against time" and not "for your time". Along with Haydn and Mozart, Beethoven is the trio of classic Viennese that is the consummation of classical instrumental forms. It was a renewal of the concepts of harmony, tonality and instrumental color and brought to perfection the Symphonic genre. Its technical features include having discarded the classical minuet rhythm by the more vigorous Scherzo, thus getting more emotionally intense contrasts and increasing loudness and variety of textures in the symphonies and chamber music. Beethoven. Ninth Symphony in d major Op. 125 ' Ode to Joy'. His work are traditionally distinguished three periods: one initial or training, which ends in 1802, called also "Bonn period"; a second period that ends in 1812 and is called "Viennese period", and a third and last that develops between 1813 and 1827. Some musicologists have shown their disagreement to this division, because they consider that you should add a fourth period, obtained by dividing in two his first time, but the division into three stages corresponds perfectly to the points of inflection of the biography of Beethoven and it continues to maintain currently. In his first term highlights his three piano sonatas and his three piano quartets, which are heavily influenced by the sonatas for violin and piano by Mozart. The Austrian musician, along with Neefe and Sterkel, represents one of their main influences in his early work. Two of his sonatas for piano, 1799 Pathétique and Moonlight of 1801 represent notable innovations in the language of the piano sonata. Other highlights of this period works are their first symphonies, which owe much to the orchestration of the symphonies London by Haydn, as well as cantatas composed on the occasion of the funeral of Emperor José II in 1790 and the arias of concert Prüfung des Kussens, Mit Mädeln sich verträgen and Primo amore. At its middle Beethoven composed most of his orchestral production. He/She developed a tone with heroic overtones can be heard in his third Symphony (called "Eroiica" and dedicated to Napoleón Bonaparte), in his Fifth Symphony and in Fidelio, scenic work whose plot follows the tradition of the rescue of 19th century operas: a woman who saved from death to her husband, prisoner of his political enemies. In addition, his piano concertos No. 4 and no. 5 (Emperor) were written in his Viennese period and have influenced Mozart in dramatic conception and relationship of the soloist with the Orchestra is concerned. Your last period is the most complex, due in part to its emotional ups and downs and its advanced deafness. He/She highlights seven sonatas for piano, whose writing moves away from the classical sonata (Op. 106 and Op. 110 include leakage between its movements) and string quartets which contain abrupt contrasts and consist of up to seven movements. His most famous work of this stage is the Symphony No. 9 (choral), whose extensive end with variations based on the text of the Ode to the joy of Schiller. Also at this stage of his life he/she became interested in folk songs, so wrote his cycle of songs An die ferne Geliebte op. 98, and often incorporated elements of the songs and dances popular in his last quartets. In November 2005 sold 1,600,000 euros for the manuscript of Grosse fuge for piano, which had been lost until then and that is probably the biggest score of the German composer. The auction took place at London's Sotheby's. The document was found by Heather charge librarian at the Palmer Theological Seminary in Philadelphia a year earlier. At the time it was composed by Beethoven as part of a work commissioned by the Prince Nikolay Golitsin de San Petersburgo, and part at the beginning of a String Quartet premiered in 1826; However, the extreme difficulty of the piece was that the editor asked the composer to do a simpler version for piano, which was later published separately, and that this was his original manuscript. Violin concerto. Cast: Phichas Zukerman, Symphony Orchestra of Chicago. Director: Daniel Barenboim. Deutsche Grammophon 447 403-2. Piano concertos. Cast: Martha Argerich, Philharmonia Orchestra. Director: Giuseppe Sinopoli. Deutsche Grammophon 445 504-2. Triple Concerto op. 56. Performers: Mark Zelster, Anne-Sophie Mutter, Yo-Yo Ma, Berlin Philharmonic Orchestra. Director: Herbert von Karajan. Deutsche Grammophon 415 276-2. Symphony No. 1, Opus 21 in c major;Symphony No. 2, Opus 36 in e major;Symphony No. 3, Opus 56 in e flat major (heroic);Symphony No. 4, Opus 60 in b flat;major Symphony No. 5, Opus 67 in c minor;Symphony No. 6, Opus 68 in f major ("Pastoral");Symphony No. 7, Opus 92 in a major;Symphony No. 8 in f major Opus 93;Symphony No. 9 in d minor Opus 125. Director: Wilhelm Furtwängler; soloists: Schwarzkopf, Hongen, Hopf, Edelmann; Choir of the Orchestra of the Bayreuth Festival (Bayreuther Festspiele); Vienna Philharmonic Orchestra. EMI 653-763 606-2 (5 CDs). Symphonies 1-9. Director: Arturo Toscanini. Cast: Farrell / Merriman / Peerce / Scott / R. Shaw Chor. The NBC Symphony Orchestra. RCA RD 60 324 QV (5CDs). Symphonies 1-9. Director: Herbert von Karajan; soloists: Tomowa-Sintow, Baltsa, Cole, Dam / Wiener Singverein / Berlin Philharmonic Orchestra. DEUTSCHE GRAMMOPHON 429 089-2 (6-CD). Symphony No. 5 in c minor Op. 67. Director: Carlo Maria Giulini; Los Angeles Philharmonic Orchestra. EMI 410-028 - 2. Symphony No. 7 in a major Op. 92. Director: Carlo Maria Giulini; Chicago Symphony Orchestra. EMI 555-769 031-2. Symphony No. 8. In f major op 93. Director: Carlo Maria Giulini; London Symphony Orchestra. EMI 555-769 031-2. Symphony No. 9. In d minor op 125. Director: Carlo Maria Giulini; soloists: Varady, Nes, Lewis Estes / E-Senff-Chor / Berliner Philharmonic Orchester. Deutsche Grammophon 427 655-2. Symphonies 1-9. Director: Arturo Toscanini. Cast: Farrell / Merriman / Peerce / Scott / R. Shaw Chor. The NBC Symphony Orchestra. RCA RD 60 324 QV (5CDs). Symphonies 1-9. Director: Claudio Abbado. Soloists: Benackova, Lipovsek, Winbergh, Prey / choir of the Vienna State Opera / Vienna Philharmonic. DEUTSCHE GRAMMOPHON 427 306-2 (6 CDs). Symphonies 1-9. Director: Christopher Hoogwood. Soloists: Auger, Robbin, Rolfe-Johnson, Reinhart; London Symphony Choir; Academy of Ancient Music; 425 696 Dec - 2 ZD (6 CDs). (standard version with original instruments). Sonatas for piano 1-32: 1. Ashkenazy. 425 Dec XL 590-2 (10 CDs). 2. Barenboim. EMI 697-762 863-2 (10 CDs). 10 sonatas for violin. Cast: Martha Argerich, Gidon Kremer. Deutsche Grammophon 447 058-2. Sonatas for cello. Cast: Mischa Maisky, Martha Argerich. Deutsche Grammophon 437 514-2. Variations and trifles. Cast: Mikhail Pletnev. Deutsche Grammophon 457 493-2. Integral of the string quartets. Alban Berg Quartet; EMI 5 73606 2 CZS (reissue in 2000 of a recording of 1978-1983). An die ferne Geliebte opus 98. performers: Dietrich Fischer-Dieskau (baritone), Gerald Moore (piano). 140 501 C ORF. Adelaide opus 46. performers: Dietrich Fischer-Dieskau (baritone) G. Demus; Deutsche Grammophon 415 189-2. Lieder (An die ferne Geliebte, In questa tomba dark, etc;) Vier ernste Gesänge, etc); performers: Dietrich Fischer-Dieskau (baritone), Jörg Demus (piano) Deutsche Grammophon DG 415-189-2. Fidelio op. 72 (Opera in 2 acts). Director: Leonard Bernstein; soloists: Janowitz, Popp, Dallapozza, Jungwirth, Kollo, Terkal, Fischer-Dieskau, Sotin, Sramek; Chorus of the Vienna State Opera; Vienna Philharmonic Orchestra. Deutsche Grammophon 419 436-2 (2 CDs). Missa Solemnis opus 123 in d major. Performers: Gundula Janowitz (soprano), Agnes Baltsa (mezzo-soprano), Peter Schreier (tenor), José van Dam (bass), Wiener Singverein and Berlin Philharmonic Orchestra. EMI 655-769 246-2 (2 CDs). Mass in c major. Performers: Robbin, Kendall, thousands, Orchestre Révolutionaire et Romantique, Monteverdi Choir. Director: John Eliot Gardiner. Deutsche Grammophon 435 391-2. Christus am Olberge (Christ on the Mount of olives) opus 85: performers: Pick-Hieronimi, Anderson, Halem; Director: Baudo; Choir and Orchestra of Lyon. 90 5181 HEK. Arnold, D. and FORTUNE, N. (eds. ); The Beethoven companion. London, Faber and Faber, 1973. COMINI, A. The Changing image of Beethoven: a study in mythmaking. New York, Rizzoli, 1987.
COOPER, B. Beethoven and the creative process. Oxford, Clarendon Press, 1990.
COOPER, Barry (ed.). The Beethoven Compendium. London, Thames and Hudson, 1991. GROVE, G. Beethoven and his nine symphonies. Madrid, Altalena, 1982. KERST, F. Beethoven: The man and the artist, as revealed in his own words. New York, Dover, 1964. METZGER, H. K. and RAINER RIEHN, r. (dirs.). Beethoven: the problem of interpretation. Barcelona, work, 1992. REVERTER, A. Beethoven. Barcelona, Peninsula, 1999. ROSEN, C. The classical style: Haydn, Mozart, Beethoven. Madrid, Alianza Editorial, 1986. WALLACE, R. Beethoven's critics: aesthetic dilemmas and resolutions during the composer's lifetime. Cambridge, Cambridge University Press, 1986.
http://www.lvbeethoven.com; web page dedicated to the figure of the German composer. Contains biography, bibliography and links to other pages. In English and French. http://www.unheardbeethoven.org; Web page dedicated to disseminate the lesser known works of Beethoven. Contains sound files. In English.